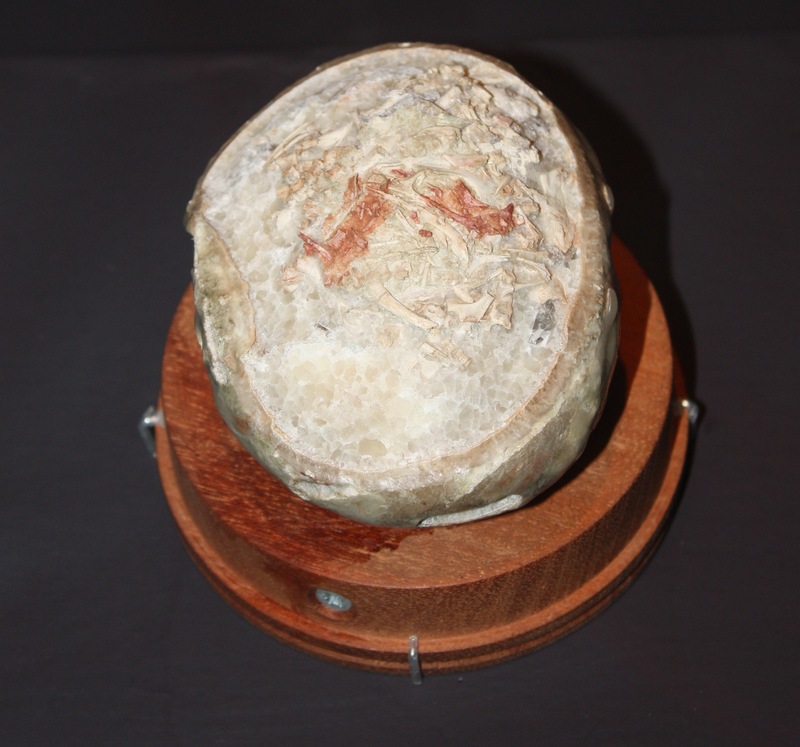 I am quite sure that this is something people have really been waiting to see following the controversy over the material, and certainly it seems to have been the subject of much discussion on the web as well as between palaeontologists. I’m not going to wade into that here, not least when I’ve been told there’s at least one more manuscript in preparation about this and it’s ontogenetic status etc. and I don’t want to interfere with or jeopardise anyone’s work with my thoughts. But the thing was on public display so a few photos seem in order. Suffice to say though, it looks pretty young to me, though I could only see it in a display case and not all of the material was there (the skull was represented by just a cast for example). Anyway, here are some photos of the beast and there’ll be a bit more tomorrow too. These piccies are a combination of the mounted cast, and the combined holotype-cast in the display cast so the lighting, angles and elements vary a lot between photos. Unsurprisingly, this proved to be a rather popular post. 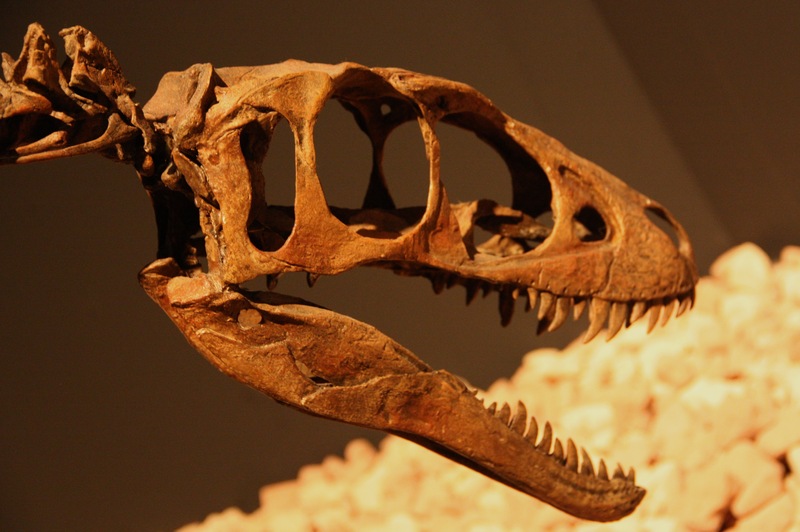 But what about other theropods – could they have chowed down on humans effectively? 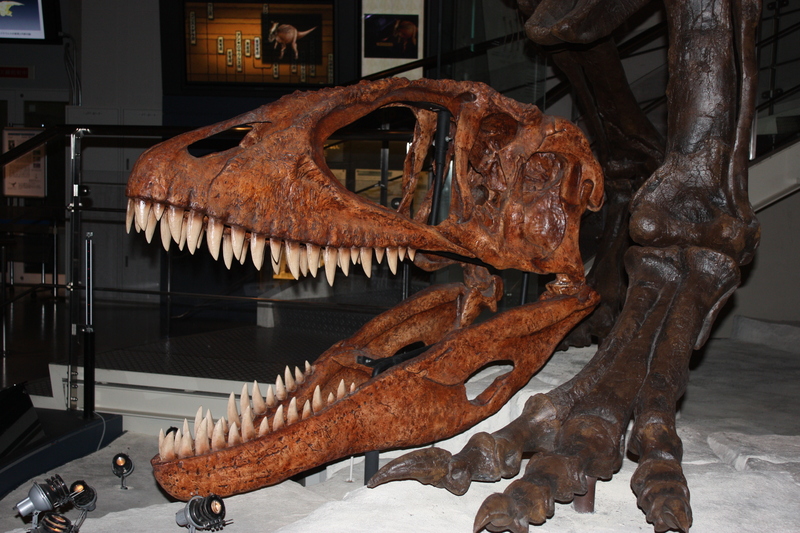 Here’s a couple of photos of the skull of Carcharodontosaurus (well, a cast) in Toyko. While, this much read post does a fair job of comparing the skulls of a tyrannosaur and carcharodontosaur, I was there only talking about the lateral view, and below you can see a head-on anterior shot that shows a very different picture. The skull as a whole and the mouth as a result is really rather narrow. This is a rather smaller specimen than the rex I showed the other day, but the proportional difference in gape laterally should be quite clear. That of course means that it would have much greater trouble in clearing the head-shoulders of a human when attempting full-body consumption. While clearly things like Mapusaurus were rather bigger, based on this I’d be surprised if even the biggest ones had a space at the back of the mouth that is comparable to T. rex. In short, if you need your hominids swallowed without processing in your upcoming sci-fi piece then stick to a giant tyrannosaurine. The basal ceratopsid Yinlong made a fleeting appearance on here quite some time ago when I was talking about ossified tendons. 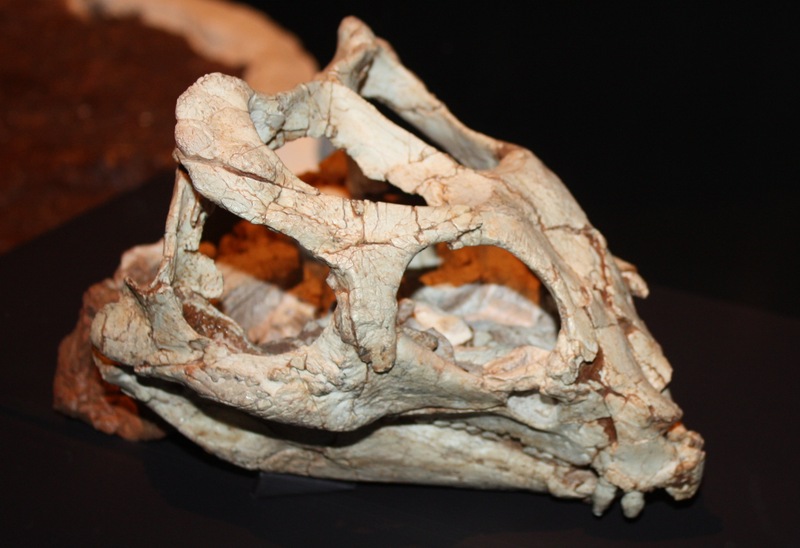 Here’s the skull of this lovely specimen, yet another of the taxa to have been unearthed at Wucaiwan in the last decade that fills in a gap of various Cretaceous lineages into the Jurassic. The skull has been on loan for some time, so this is photo from the Tokyo Expo was actually the first time I’d seen it. While there is obviously some variation in the teeth and jaws of sauropods, they are on the whole pretty conservative when compared to the theropods or ornithischians (none of them have beaks for starters!). Rather peg-like clippers of one form or another seem to be the main theme. 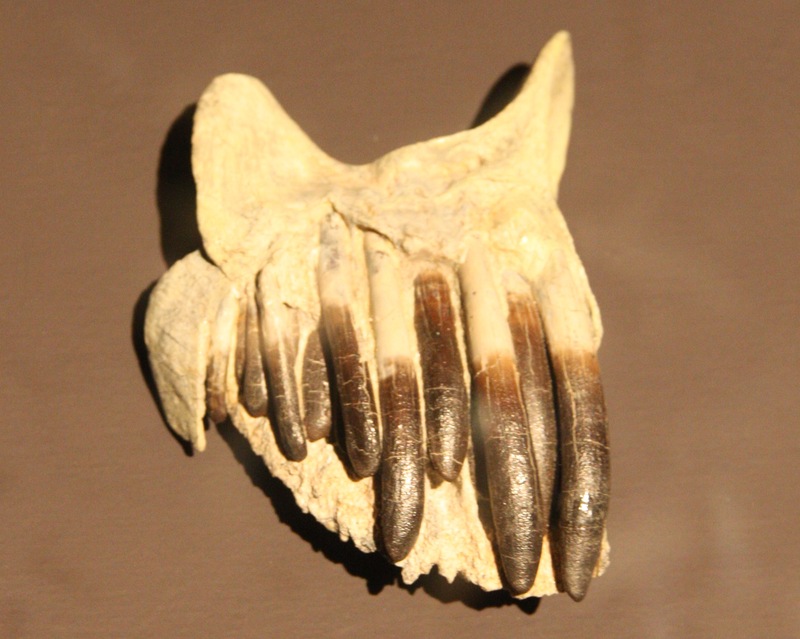 This nice set of jaw piece though does show that if nothing else, the size and number of the teeth can be dramatically different across a jaw of otherwise similar size. 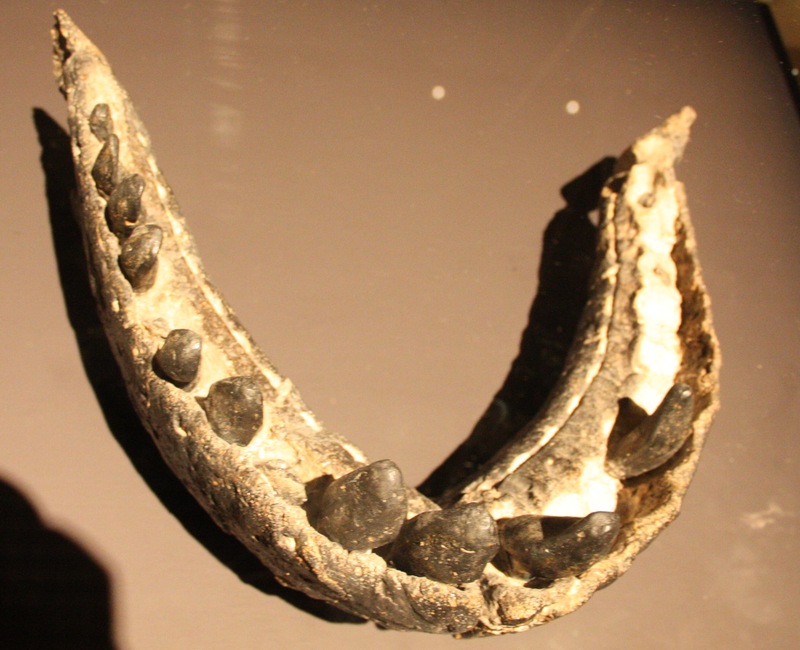 Here we have the multiple and very small teeth of Nigersaurus (top), rather more robust, but still ultimately long, thin and quite numerous teeth of Apatosaurus (middle), and finally the much larger and more robust teeth of Camarasaurus (bottom). Nigersaurus is especially nice and odd as you can see the huge numbers of replacement teeth sitting in situ the gives this an appearance that’s something like a dental battery of a derived ornithischian. Perhaps the most obvious mainstay of dinosaurs in art and culture is the stand-off between the giant, fanged Tyrannosaurs and the horned and frilled Triceratops. It’s pretty much a cliché for dinosaurs that these two will fight each other when together and that the predator is always after his well-defended prey. Obviously, I generally don’t think that tyrannosaurs (or most theropods for that matter) tackled healthy adult prey when there was a great selection of tasty, small, largely defenseless and naïve juveniles around. Now that makes sense at the best of times (and is borne out by what modern predators do, not to mention the inferences about dinosaurs) but a photo like this really makes you wonder. 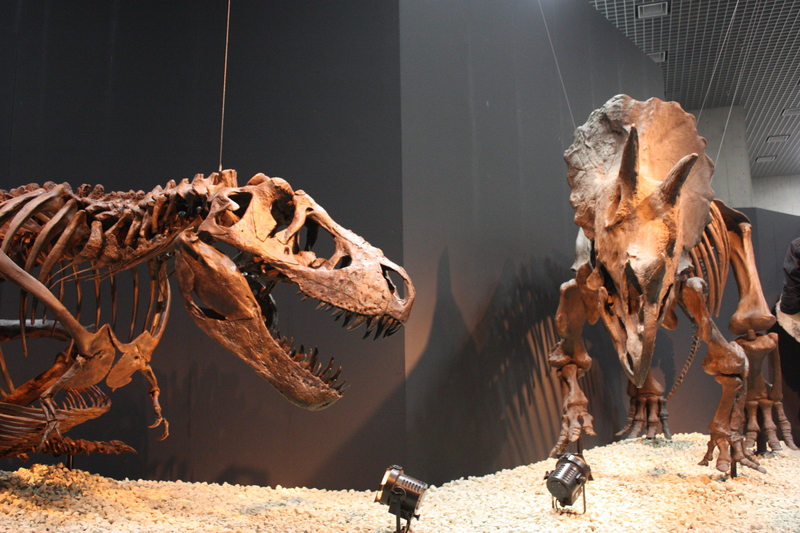 OK, rexy is lying down (and it’s not the biggest specimen), but the difference in size is quite obvious. Triceratops is really, really big. Even in comparison to the ‘king’ it’s a huge animal with a massive skull, long horns, and a big body and a lot of weight behind it. There’s reason lions don’t generally tackle adult buffalo and won’t go near rhinos and that’s because they are too likely to get stompted, gored, or generally injured. 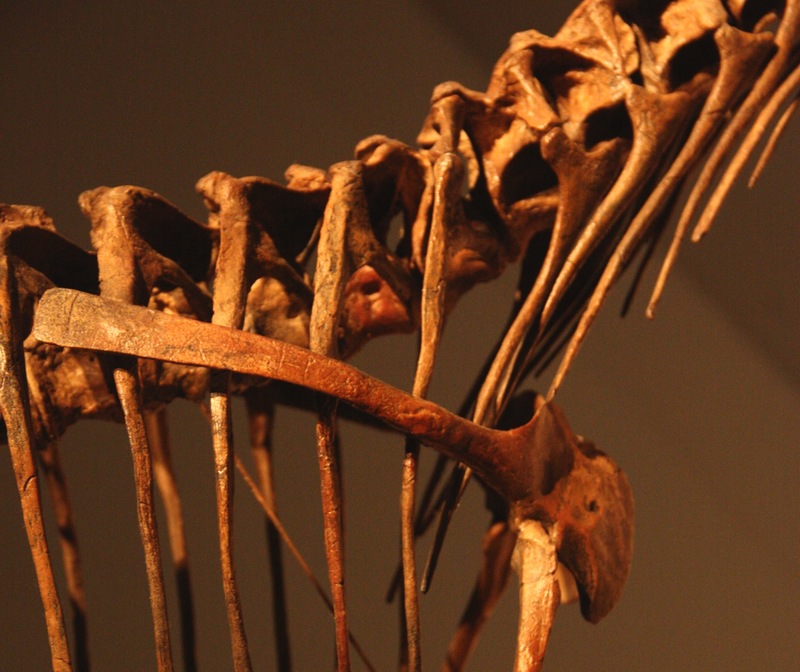 This is a big and intimidating animal, and while eyeballing skeletons is not the best way of assessing complex behaviours, I do find it hard to believe that this was a normal prey choice for a tyrannosaur. To help or best left alone? 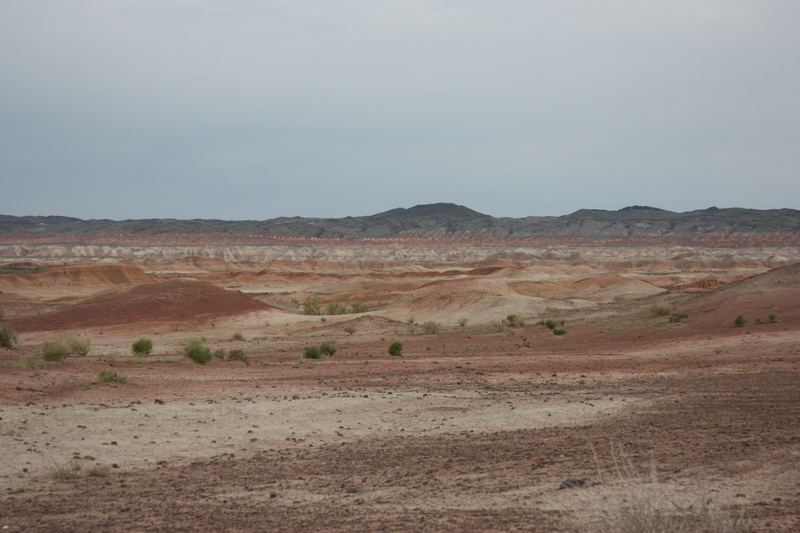 I’ve recently spent a bit of time on a variety of dinosaur / palaeo sites frequented by kids and those with no more than a very casual interest in the field. One common feature of these is the often profound lack of accuracy heralded by various posts and comments (though often to a very enthusiastic reception). As someone who obviously works on dinosaurs, but moreover has a strong interest in science communication and the public understanding of science this leaves me with some questions about what, if anything I could (or should) do about this. I thought therefore I’d pen this little note and see what people think and especially ask about experiences you had in building towards an interest in the field. I’m not advocating any strategy myself. I’ve recognised this issue for a while and have done nothing partly out of not being sure if I should even do anything, but also a lack of time to invest in any potential intervention. I’m simply trying to lay this out as what I see as a dilemma and use that as a springboard for further discussion. As I see it there are two obvious and basic things that can be done and each has its problems and benefits. The issue is that these people (and mostly young-ish kids through to teens as far as I can tell) are often badly misinformed (for whatever reason) about the real facts of dinosaurs and / or research. They don’t have access to the literature (or are even aware it exists) and are reliant on intuition and whatever sounds good over what is right (or probable). While there are good books out there and obviously blogs and websites where anyone can engage with real practicing scientists, these sites tend to be rather enclosed with people only interacting with each other and so getting endless positive reinforcement for their ideas with no real outside input or criticism. Now I don’t expect them to be scientists (hell, I wasn’t aware the literature existed till I was an undergraduate, and didn’t know what it really meant for some time after that). However, if they are as interested as they seem to be, it would seem to me a good thing for me (or people like me) to try to intervene and help them along the road towards more knowledge and a better understanding. However, that is likely to be a lot of work (answering a colossal number of questions, trying to boil down difficult concepts, arguing over points etc.) and this is likely to do little more than upset many of them or put them off science and scientists. Maybe I’m not imaginative enough but it seems hard to try and do this without divesting them of a huge mountain of nonsense and beloved theories etc. and that’s not likely to go down well. They might be much better off being left alone to mature and develop and if they have a real interest in the subject, they will come to read deeper and better and come around to a better understanding and real picture of dinosaurs and research. On the other hand, starting them off early with some real information and ideas about science might get them there much sooner. Some, even many, might be inspired and interested and advance much faster. They might also drop some of the negativity that I can often experience in occasional blog comments etc. when people come over with very fixed ideas that must-be-right-because-they-say-so type things. In short, it is better or worse to try to help out / intervene / interfere? Will they be put off and annoyed by big-shot scientists pointing out their ideas are nonsense (however nicely), or will they be thrilled to engage with real experts and push themselves to do better? Will they get better on their own eventually or should they be helped? And if we do this, will it be a huge amount of work for little thanks or benefit, or really bootstrap a few to a new level of interest and understanding? Obviously this is going to vary from person to person, but I’d be most intrigued to see what people think, and what experiences they have had at various times in their lives as experts, or with encountering experts. Did this help or hinder? Were your ideas well received or did they result in tears and tantrums? Did you grow up isolated from real experts and found your ideas changing as you learned more, or were you stuck in a rut till someone helped you see the light? 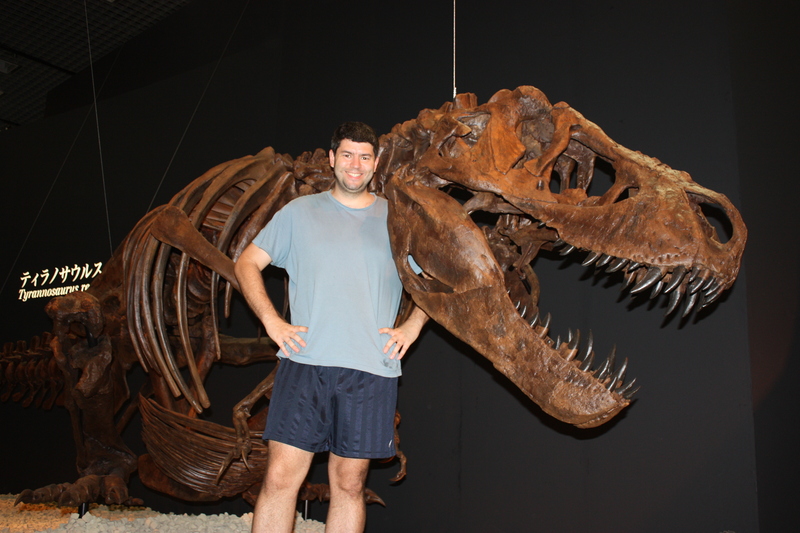 The burning question in palaeontology: can a Tyrannosaurus swallow an adult human whole? Thanks to an unusually mounted Tyrannosaurus I was able to delve into this important issue in palaeontology. 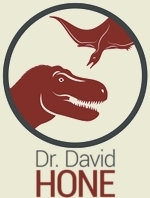 While it was famously noted in a paper that a Tyrannosaurus wouldn’t need to eat too many lawyers to keep its metabolism ticking over, the question remains, quite how would, or even could it, consume a human all but whole. Here you can see that my head and shoulders (my widest point, and I’m a bit above-average sized for a human male) fit through the space between the two scapulae, gastralia and dorsals. It’s a bit of a tight fit, but I can make it. This might be a struggle for rexy, but is probably not impossible. While I have no photo, I also checked to see if I could get my shoulders through the back of the jaws and again it’s possible, though it’s an even more narrow fit this time. So there you have it. It does indeed seem that a Tyrannosaurus really could swallow a whole human in one go, though anyone much bigger than me would probably be a morsel too big. While clearly frivolous, this does show just how big some chunks of flesh and bone could potentially be consumed by an animal this size, and even a decent sized hadrosaur could probably be got down in just a dozen or so bites over a few meals. 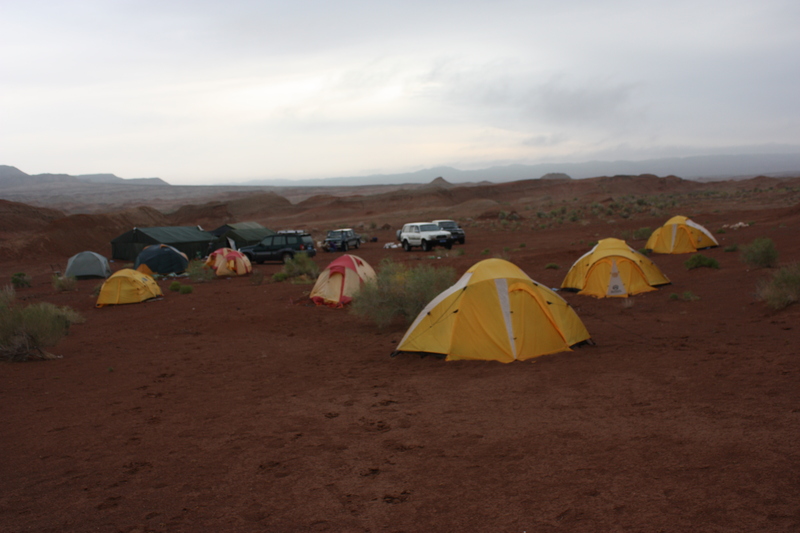 While few of my posts have hit any kind of length in terms of text recently, this is rather set to continue the trend as there is simply not much to tell about this year’s expedition. As with last year, there was a couple of weeks in the Shishugou combined with a short excursion to the Tugulu, cut short in my case first by illness and then a rainstorm necessitating a early departure in case I got stranded. As noted recently, the Shishugou at Wucaiwan tends to be an all or nothing place: you can go for days without finding more than couple of scraps of bone, but when you do, it can be a whole specimen or even a whole block of specimens. This year was no different, but (for me) one major difference. The person who found the big block of material was me. It is, without doubt, the best single find I’ve been responsible for and as such I’m rather delighted. Naturally most of what we found is still in the jacket and we only exposed various bones to see what was there and how far it extended into the hillside. Suffice to say there is a fair bit of material, and a very healthy (i.e. far too big) jacket was removed with a number of bones in. It’ll probably be a year or two before I really get to see properly what I found, but I’m already looking forwards to it (especially given my strong suspicions about what it actually is). 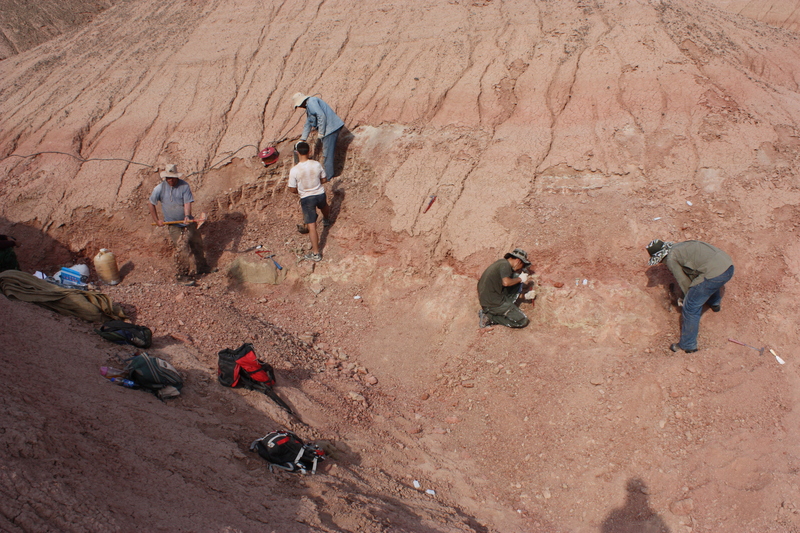 In the Lower Cretaceous Tugulu rocks I was able to continue my campaign to accumulate dsungaripterid pterosaur material with some nice new pieces including a couple of quite large cervicals which is good. A few more years like this and they’ll be quite a pile of material to work on. That is about it really, though it’s worth commenting that for whatever reason there was a pronounced absence of wildlife around this time. Few insects and spiders and fewer still reptiles and birds, or even mammals, so I have not a single new photo of any animals out there. The best I managed was a pair of dead jerboas but I didn’t have my camera with me when I saw either of them. In context I suspect there was a harsh winter or a delayed spring and the animals suffered as a result, natural selection in action really. 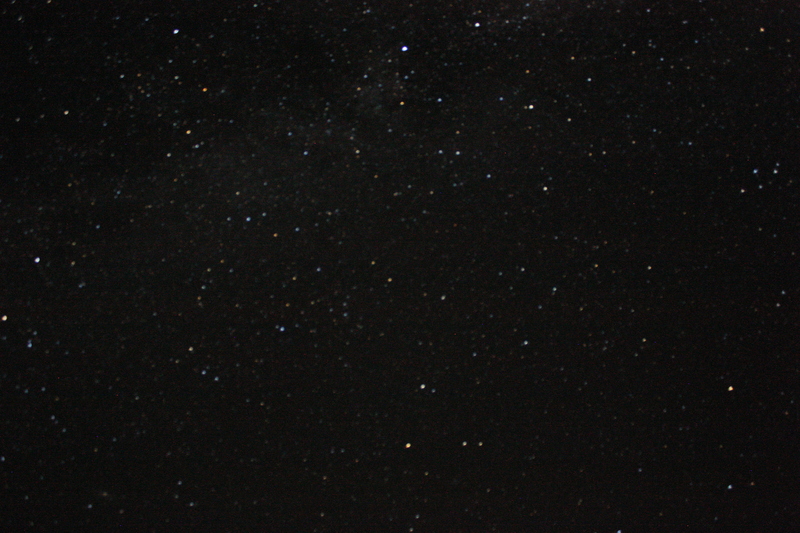 On the upside the weather and night sky combined for some beautiful scenes. I started writing this post before I checked my photos and was rather dismayed to see that pretty much everything I took at the Dino Expo was out of focus. Whoops. I do have my own photos from the IVPP, but obviously I wanted to stick to the exhibit on the Musings. Obviously in this case that rather means that I’m limited to one rather less than exciting image of the postcranium. In an effort to make this post marginally more readable / interesting, it’s perhaps worth adding a few lines about the nature of the bones here, and indeed a number of things from the Shishugou Formation. While you do tend to get whole articulated skeletons from this area (and for that we really must be grateful) the bones are often rather bashed up and look like they’ve been broken in situ but preserved in the correct aspect and orientation. It makes for an unusual combination of complete articulated specimens which are not always very nice in terms of preservation. But they do at least keep coming. 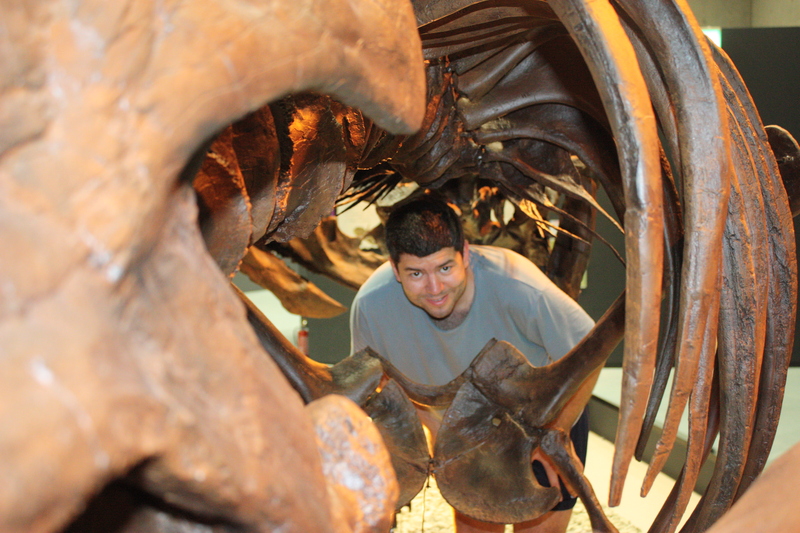 All things considered, dinosaur embryos are not actually that rare. The issue with many however, is working out what taxon they might belong to. After all, a very young ceratopsian is not going to have much of a crest or horns which is generally how we identify them. In fact the skull is often the weakest and most disintegrated part of even a great embryo and as such quite a few are left as simply ‘indet’ on their designations. 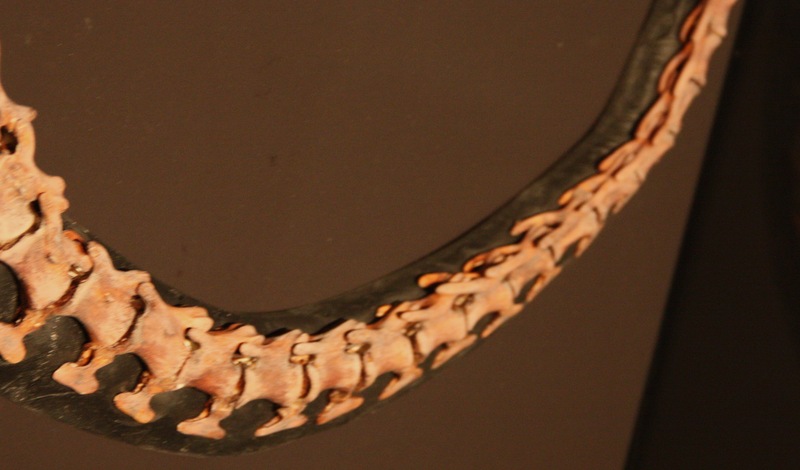 This is, sadly, another one, but the identification is quite specific – it belongs to a therizinosaur. These are not especially common taxa and aside from this. I’m not aware of any other eggs assigned to the group which makes one with an embryo in rather special. Of course there’s not too much to see here, the bones are tiny and (shooting through glass a distance away) it’s not the greatest of photos. 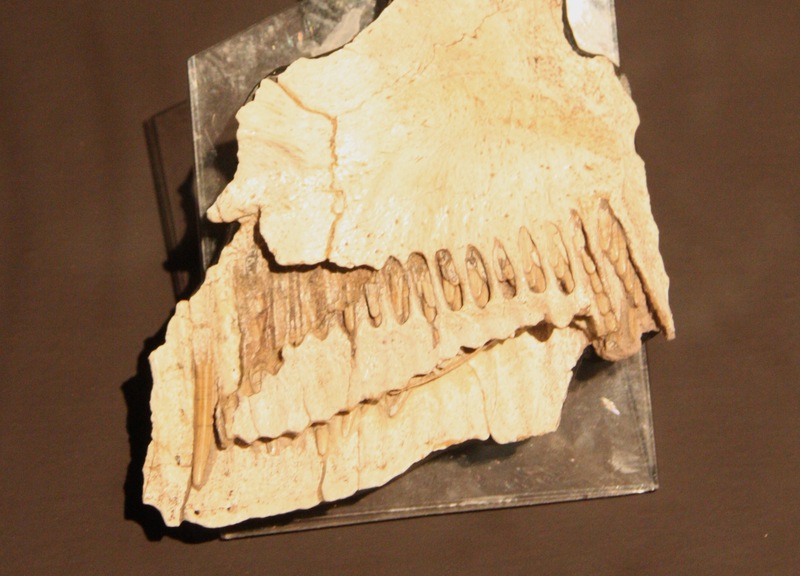 Still, it is nice to see just what detail can preserve on occasion, and if you look carefully, you should be able to see an associated premaxilla and maxilla that make up the snout and outline the naris and antorbital fenestra. Cool! 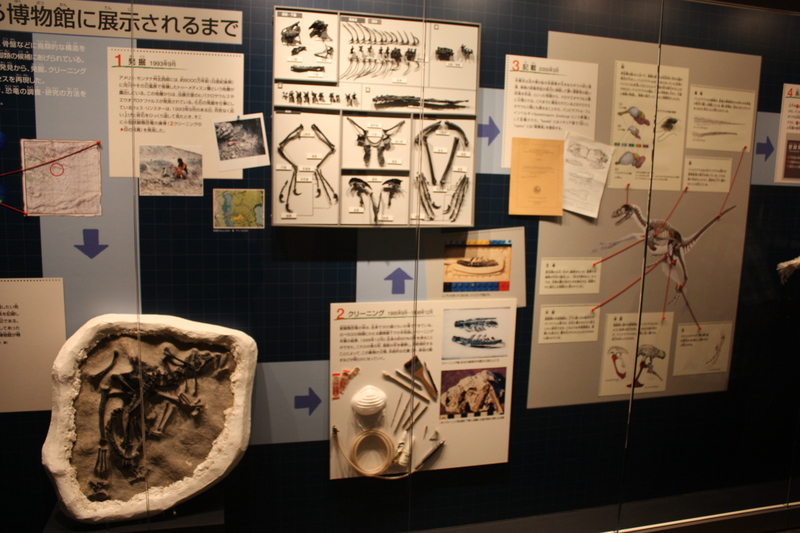 This sign / collage sits in the doorway of the dinosaur gallery in the Tokyo museum and it is a truly superb summary of the art and science behind a dinosaur discovery. 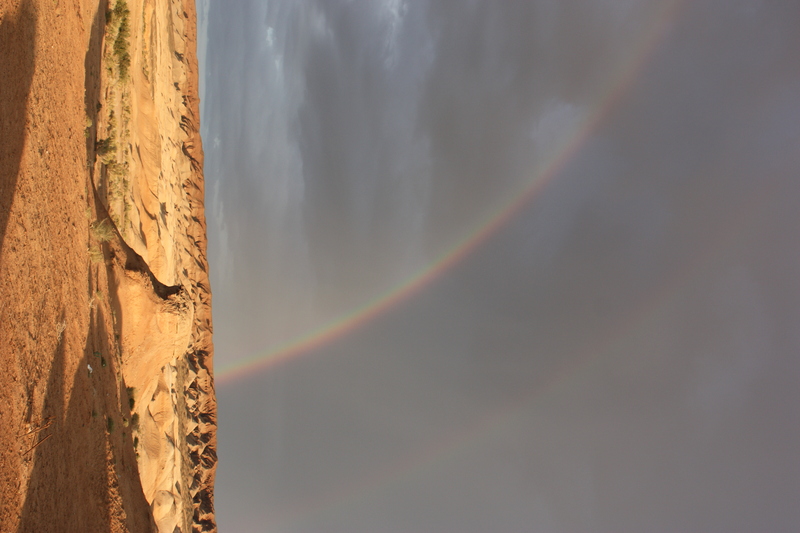 In a few quick moments, you can grasp what it really means to discover a dinosaur and give it a name. 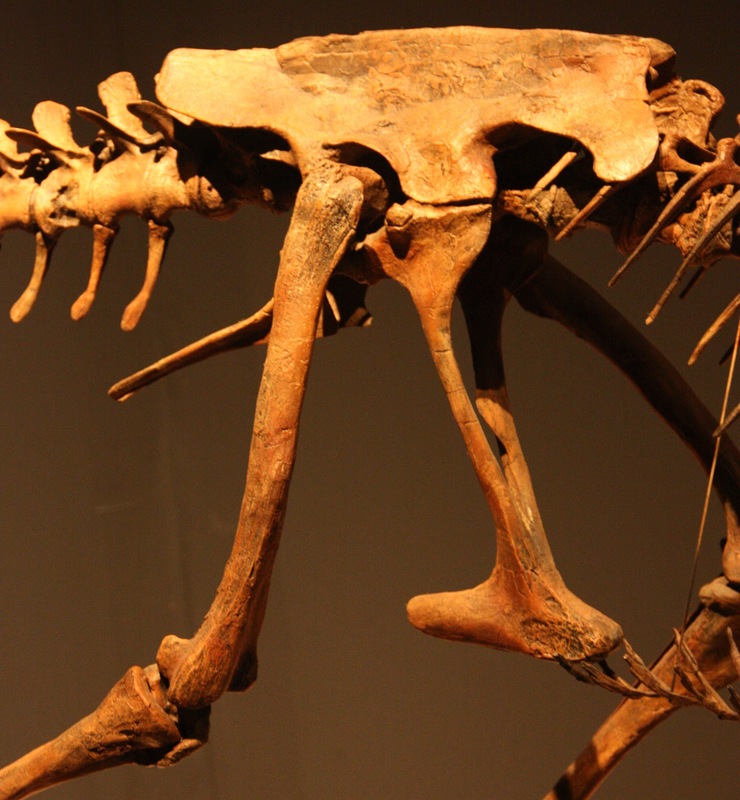 What actually happens from the moment there is bone seen on the surface through to an official name being published in a paper and a new entry being added to the roll-call of Dinosauria. It is, is short, brilliant. Clever, succinct and important, it also helps give gravitas and explanation behind what the academic side of this is actually about and that these huge monsters in the next room are not just cool, but fascinating animals about which we have learned much, continue to learn more, and that this is all based on bones and scientific discovery, and not guesswork. The gallery illustrates what dinosaurs are all about, in addition to being a simply entertaining display of big dead lizards. I’d love to see more of these kinds of signs in museums. People can always not read them if they are not interested, but for those who are, it’s a massive boon and really helps sets the scene. I’m sure large numbers of people simply don’t realise there are such things as academic papers, or what is required to officially name a new species, or quite how you get from ‘field palaeontology’ to ‘this animal did X’ which are the only two things you tend to see in documentaries. This is however, an especially nice and fundamentally clever display to have got this in such clarity in such a small space.